Dragon Quest X producers Yosuke Saito and Yuu Miyake envision overseas versions split across regional servers. 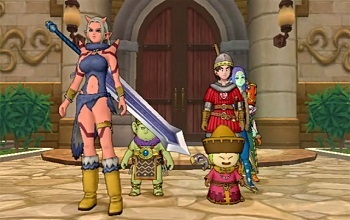 Dragon Quest X is only a few short weeks from its first birthday following its 2012 launch on the Wii. That said, whereas other one-year olds busy themselves with things like learning to walk, Dragon Quest X could possibly find itself learning new languages. While Square Enix already surprised some when it announced the MMORPG would be making a move to PCs, Yuu Miyake, executive producer for Dragon Quest X, has expressed that the company hopes to move the game not just across platforms, but also across borders. Asked if Square Enix was considering an overseas release, Miyake's response was "Of course." That being said, he was quick to clarify that the actual process of expanding Dragon Quest X's reach won't be simple. "Every nation has its own play style and sensibilities, so I don't think it'll be a single game worldwide like with Final Fantasy 11." Producer Yosuke Saito, who was also present for the interview shared similar sentiments. "Different countries consume their games at different speeds and the way the communities are run also differ. Even the way people enjoy seasonal events is different, so I think we need to divide the running of it by country or region. So we're thinking about having separate servers for each country." While it might be a bit of a bummer not to be able to mingle with foreign players, regional servers could also potentially allow Square Enix to tailor the game's services uniquely depending on the tastes of different countries and cultures. Either way, we hope to see Dragon Quest X in North America at some point, if only because more Dragon Quest tends to be a good thing.